We've traveled for years, but have only documented a few of our adventures. Follow along on some of our favorite RV camping trips. 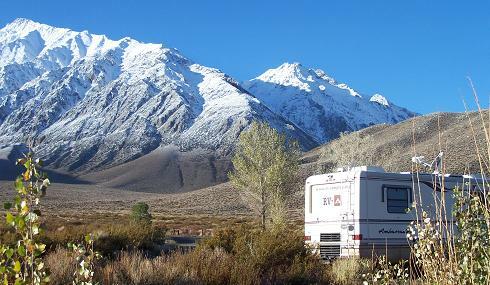 Hundreds of public and private campsites located along the eastern Sierra Nevada Mountains. Outdoor recreation includes horseback riding, fishing, hiking, biking, hot springs, earthquake fault, Devil's Postpile, Rainbow Falls, and more. Come along with us as we explore the history and sights of western Nebraska. From one of the world's most interesting sports stores in Sidney, to the Nebraska National Forest near Chadron, we find great RV camping, and some great places to visit. We travel back in time from modern day ranching, to the prehistoric days of the dinosaurs. Come along on our tour of Picketwire Canyon to the largest dinosaur track site in North America, Indian petroglyphs, early homesteaders, and historic ranching country. Great free RV camping available too! This 30 day travelog covers our 6000 mile road trip to Alaska. Follow our exploits and see spectacular scenery. We followed the route of the Alaska Highway, and met some interesting folks along the way. Abundant wildlife, and free RV camping everywhere made this a trip of a lifetime.